A strange scene discovered on Alaska’s North Slope depicts the mass deaths of nearly a dozen unusual dinosaurs, according to paleontologists. The specimens are all ceratopsids — the group that includes the widely known Triceratops as well as several other types of frill-faced, four-legged herbivores that have been discovered just this year throughout the American West. But instead of sporting Triceratops’ trademark tapered horns, the animals found in Alaska featured big, uneven lumps of bone on their noses, along with two horizontal horns, like those found on cattle today, sprouting from the tops of their frills. The dinosaurs were first described by paleontologists from Texas’ Perot Museum of Nature and Science a year and a half ago, who named the new species Pachyrhinosaurus perotorum. 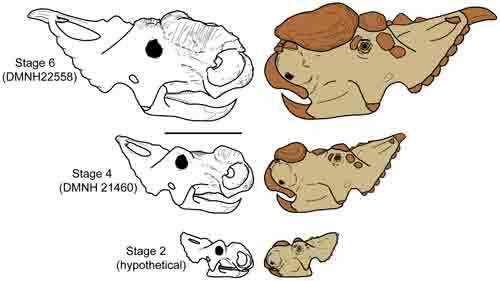 And now, after having taken the 11 specimens back to their Dallas lab, the researchers have found that the fossil remains also include a juvenile — a ceratops in early adolescence who had weirdly unique features befitting those awkward years. Paleontologists were initially puzzled as a different sort of small ceratops began to emerge from the rock — one with a longer, narrower snout that featured a modest, more horn-like growth. “After a couple weeks of working on it, our question was, ‘What on earth is this?’ It had features on it that looked like the big adult skull of the Pachyrhinosaurus perotorum that we had originally found, yet it was very narrow and skinny and didn’t have the big expanded nose of the adult,” said Dr. Ronald Tykoski, a member of the Perot Museum team, in a statement. The team theorizes that the small horn found on the young dino eventually grew and merged with other growths on its face to form the larger, flatter, lumpy mass — called a nasal boss — which adults probably used as battering rams in battle. Describing the young offspring as having a face only a mother could love, team leader Dr. Anthony Fiorillo said that the find nonetheless sheds light on a species that’s unique for many reasons. “Discoveries like this help us to realize that this unique polar dinosaur isn’t just a trophy on the wall, but was a living, breathing animal,” he said in a release. And while the cause of the animals’ sudden death isn’t immediately clear, their contribution to our knowledge of ancient Alaska is becoming more obvious with time. Dated to a mere 70 million years ago, P. perotorum is the most recent species of ceratopsid ever discovered, the team points out, and it’s also found farther north than any other member of its dinosaur family. 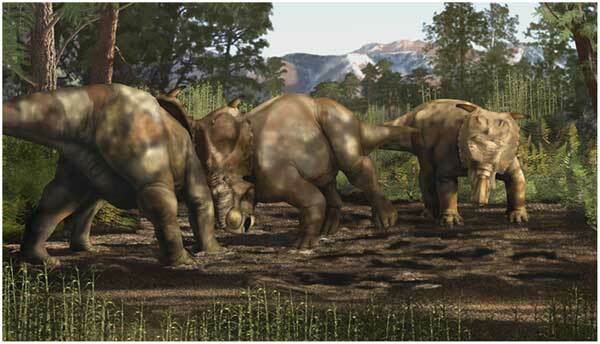 “The finding of this juvenile implies that the Artic, which was believed to be too harsh a climate for dinosaurs to survive, was an environment not only ripe for productivity, but shows that the species of Pachyrhinosaurus perotorum was reproducing and living there contentedly,” Fiorillo said.